Top: The observed RVs and the best-fit single Keplerian curve for 24 Boo. The horizontal axis is the orbital phase. The derived stellar jitter is also included in the error bar. Red circles and green triangles are data taken with slit- and fiber-mode, respectively. Bottom: The RV residuals to the orbital fitting. Credit: Takarada et al. 2018. Using radial velocity method a group of Japanese astronomers has found that two evolved stars, namely 24 Booties and Gamma Librae, are orbited by gas giant planets. They discovered that 24 Booties hosts one planet, while Gamma Librae is circled by two alien worlds. The finding is detailed in a paper published April 11 on arXiv.org. Thanks to the radial velocity (RV) technique, over 600 exoplanets have been detected so far, but the number of known RV planets orbiting evolved stars is still small. Filling this gap is needed in order to provide more comprehensive image of the variety of extrasolar planetary systems. One astronomical survey, which has the potential of improving our knowledge about planets orbiting evolved hosts, is the Okayama Planet Search Program. Recently, a team of Japanese astronomers, led by Takuya Takarada of the Tokyo Institute of Technology, has reported the finding of three such exoplanets of this category, by conducting RV measurements at the Okayama Astrophysical Observatory (OAO) in Japan. "We here report two new planetary systems around evolved stars: 24 Boo and γ Lib. This result is based on RV measurements performed at OAO with the 1.88-m reflector and HIDES," the researchers wrote in the paper. 24 Booties (24 Boo for short) is a star of spectral type G3IV, similar in mass to our sun, but almost 11 times larger. Takarada's team found that this star is orbited by a gas giant planet, which received designation 24 Boo b, every 30.35 days at a distance of about 0.19 AU from the host. The researchers estimate that the minimum mass of the newly found planet is 0.91 Jupiter masses. Gamma Librae, or γ Lib, is around 11 times larger than the sun, has a mass of approximately 1.47 solar masses, and is of spectral type K0III. The astronomers discovered that this star hosts two gas giant planets—γ Lib b and γ Lib c, with minimum masses of 1.02 and 4.58 Jupiter masses respectively. Located about 1.24 AU from the parent star, γ Lib b needs about 415 days to fully orbit its host, while γ Lib c has an orbital period of nearly 965 days as it is separated from the star by approximately 2.17 AU. Notably, both 24 Boo and γ Lib have low metallicities (-0.77 and -0.30 respectively) among the giant stars hosting planetary companions. In concluding remarks, the astronomers emphasize what makes their discovery unique. They note that the planet 24 Boo b has the shortest orbital period ever found around evolved stars with a stellar radius larger than 10 solar radii. Furthermore, γ Lib turns out to have the second lowest metallicity among the giant stars with multiple planetary systems. 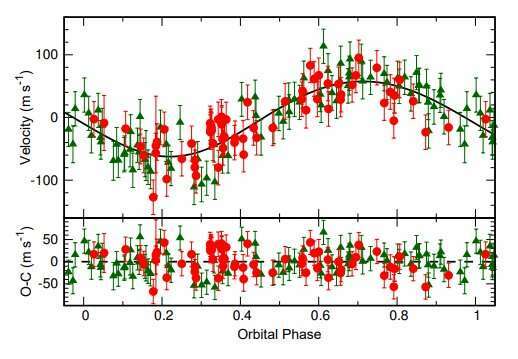 The researchers also add that the orbital period of γ Lib c is about 2.33 longer than γ Lib b, noting that such ratio is rare among planetary systems around giant and dwarf stars. We report the detection of planets around two evolved giant stars from radial velocity measurements at Okayama Astrophysical observatory. 24 Boo (G3IV) has a mass of 0.99M⊙, a radius of 10.64R⊙, and a metallicity of [Fe/H]=−0.77. The star hosts one planet with a minimum mass of 0.91MJup and an orbital period of 30.35d. The planet has one of the shortest orbital periods among those ever found around evolved stars by radial-veloocity methods. The stellar radial velocities show additional periodicity with 150d, which are probably attributed to stellar activity. The star is one of the lowest-metallicity stars orbited by planets currently known. γ Lib (K0III) is also a metal-poor giant with a mass of 1.47M⊙, a radius of 11.1R⊙, and [Fe/H]=−0.30. The star hosts two planets with minimum masses of 1.02MJup and 4.58MJup, and periods of 415d and 964d, respectively. The star has the second lowest metallicity among the giant stars hosting more than two planets. Dynamical stability analysis for the γ Lib system sets a minimum orbital inclination angle to be about 70∘ and suggests that the planets are in 7:3 mean-motion resonance, though the current best-fitted orbits to the radial-velocity data are not totally regular.